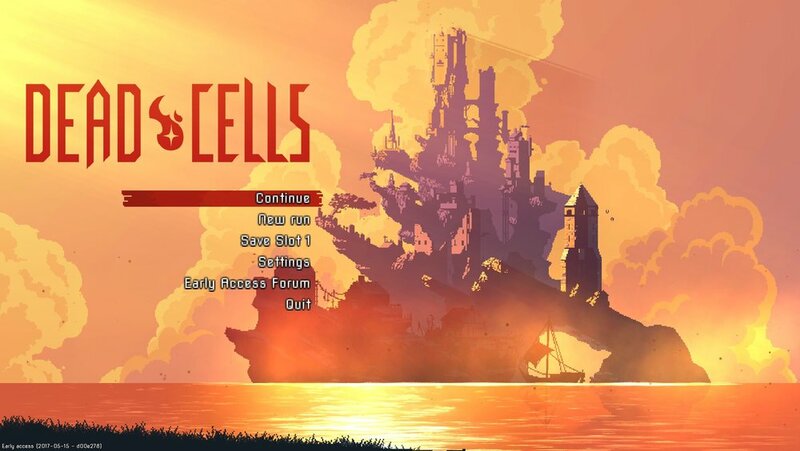 There are few “genres” that I’m generally invested in at their mere mention, but it’s even more impressive that I’m enjoying Dead Cells as much as I have specifically because of the other 2 genres it draws from: roguelikes and "Souls" style games. I’ve dipped my toes into this style of game before with Rogue Legacy, but bounced off it pretty quickly, mostly due to the randomization of the characters on each run being vastly different. It finally seems to have clicked with Dead Cells though, which is in Early Access now. At its core, Dead Cells is a “16-bit” styled action platformer with randomly generated levels, brutal difficulty and excellent gameplay. It’s amazing to think this is an Early Access game, since everything I’ve played so far feels pretty feature complete to me. Controls are paramount in a game like this, and the amount of time I’ll devote to these types of games is expressly tied to how it feels to play. Dead Cells certainly doesn’t disappoint. The jumping and movement all feel precise and crisp, whether using an analog stick or d-pad. The platforming is generally excellent as well, with your character able to roll, double jump and even do a stomp attack right out of the gate. This means nothing is out of reach, especially since the fluidity of movement is fantastic. The only minor quibble I have relates to the random generation of the levels, which can result in downward pathways that are too narrow to navigate. The main reason this is bothersome is because your character automatically grabs and ledge and climbs up, which makes for some tricky navigation sometimes. Overall though I never feel like I can’t get to where I’m going, once you get where you’re going though, things can escalate quickly. Which brings me to the combat, which some folks (including myself just above) have classified as “Souls” combat. As someone who tried (really hard) to play both the first Dark Souls & Bloodborne, I feel like the combat in this game is more manageable. There’s no stamina, so you can attack forever, and the ability to “get away” from enemies means this game has much better survivability. As for the combat itself, you can carry up to two “main” weapons, which vary between melee weapons (swords, daggers,) shields, bows and even a few “spells” that have various effects and even a strengh progression as well as “special” abilities. Thing is though, nothing here is permanent, since each run is randomized as to what you’ll find. The subweapons also play a big role in how I’ll tackle a particular “run” since one run can have you equipped with a simple grenade and possibly a bear trap, which means you can snare a guy before tossing the grenade. Or you may have an automatic arrow turret and flashbang grenade, which means you can stay out of combat a bit to conserve your health. And you will definitely need to keep an eye out on your health, since even the simplest enemies can take you down in a few seconds if you aren’t paying attention. I’ve had some of my best, longest runs cut short dramatically by being killed in one-hit from a single enemy type I first encountered in the earliest areas of the game. If I have a complaint here though, it would be that some of the enemies appear to be able to “lock” you up with a flurry of attacks and kill you in mere seconds, thus spoiling a potentially excellent run. Luckily, the enemies all do have a pretty distinct pattern, the only exceptions being the boss level “elite” monsters you generally have to spawn voluntarily to fight, so you can actually avoid them if you really want. Also, in the similar vein to Souls games, you have a limited healing mechanic you can upgrade a bit. Also completing each area gives you a small “respite” area where you can spend your hard-earned currency and cells to unlock upgrades or purchase some equipment to help extend your run. As I continue to pine for Chasm to finally get finished and released, it’s good to know that I’m still able to scratch that itch with something new instead of playing Symphony of the Night for the umpteenth time. If you have played a similar style game before and bounced off it like I did, be sure to give Dead Cells a chance, and hopefully you’ll be as pleasantly surprised as I was.